Introduction: The history of lasers in medicine. Part 1 Laser-tissue interaction: Laser characteristics; The response of tissue to laser light; Optical fibers for medical applications. Part 2 Types of laser used in medicine: Solid-state lasers for medical applications; Gas lasers for medical applications; Liquid and solid-state tunable organic dye lasers for medical applications; Semiconductor lasers for medical applications. Part 3 Lasers in diagnostics: Optical sources for optical coherence tomography (OCT); Laser spectroscopy in medical diagnostics; Optical biopsy for cancer detection; Time-resolved fluorescence polarization spectroscopy and optical imaging of smart receptor-targeted contrast agents in tissues for cancer detection. Part 4 Laser therapy and surgery: Laser therapy in ophthalmology; Lasers in dermatology; Lasers in cardiology; Lasers in urology; Lasers in gynecology; Lasers in otorhinolaryngology (ORL) and head and neck surgery; Lasers in neurology; Lasers in dentistry; Laser in orthopaedic surgery; Cancer laser therapy using gold nanoparticles; Hybrid laser technology for biomaterials; Laser safety: Regulations, standards, and guidelines for practice; Photodynamic therapy for human malignancies with superficial and interstitial illumination. Lasers have a wide and growing range of applications in medicine. 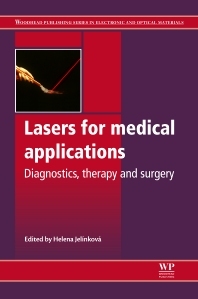 Lasers for Medical Applications summarises the wealth of recent research on the principles, technologies and application of lasers in diagnostics, therapy and surgery. Part one gives an overview of the use of lasers in medicine, key principles of lasers and radiation interactions with tissue. To understand the wide diversity and therefore the large possible choice of these devices for a specific diagnosis or treatment, the respective types of the laser (solid state, gas, dye, and semiconductor) are reviewed in part two. Part three describes diagnostic laser methods, for example optical coherence tomography, spectroscopy, optical biopsy, and time-resolved fluorescence polarization spectroscopy. Those methods help doctors to refine the scope of involvement of the particular body part or, for example, to specify the extent of a tumor. Part four concentrates on the therapeutic applications of laser radiation in particular branches of medicine, including ophthalmology, dermatology, cardiology, urology, gynecology, otorhinolaryngology (ORL), neurology, dentistry, orthopaedic surgery and cancer therapy, as well as laser coatings of implants. The final chapter includes the safety precautions with which the staff working with laser instruments must be familiar. With its distinguished editor and international team of contributors, this important book summarizes international achievements in the field of laser applications in medicine in the past 50 years. It provides a valuable contribution to laser medicine by outstanding experts in medicine and engineering. Helena Jelinkova is Professor of Applied Physics in the Faculty of Nuclear Sciences and Physical Engineering at the Czech Technical University in Prague. Professor Jelínková is internationally renowned for her research on solid state lasers and their applications in such areas as medicine.